Saint Andrew is the Patron Saint of Scotland, and St. Andrew’s Day is celebrated by Scots around the world on the 30th November. The flag of Scotland is the Cross of St. Andrew, and this is widely displayed as a symbol of national identity. The “Order of Saint Andrew” or the “Most Ancient Order of the Thistle” is an order of Knighthood which is restricted to the King or Queen and sixteen others. It was established by James VII of Scotland in 1687. A disciple of Jesus and the brother of Simon Peter . The two are pictured as fishermen working beside the sea when Jesus summons them to follow him and become, “fishers of men.” Although less prominent than his brother, Andrew is present at the miracle of the bread and the speech on the Mount of Olives. In the list of the Twelve, Andrew is listed second in Luke and Matthew and fourth in the books of Mark and Acts. In all accounts he was one of the first, as a follower of John the Baptists, to be “called” a disciple. According to later traditions , Andrew became a missionary to Asia Minor, Macedonia, and southern Russia. In 70 AD he was martyred in Patras, Greece. Having many coverts, he was feared by the Roman governor who had him cruxified on an X-shaped cross known as a Saltire Cross. (One of the many Medievil customs of torture). It is this shape that is reflected in the Scottish flag. ( for culture buffs who attribute the southern “bubba or redneck” culture to early Scottish settlers, take note of the similar designs between the Scottish flag and the Confederate flag). St. Andrew is the patron saint of Greece, Russia and Of course Scotland. …tyranny and terror were the tools being used by England to rule Scotland. Occupied and oppressed, the Scottish nation sought a hero to challenge the cruelty of King Edward I. 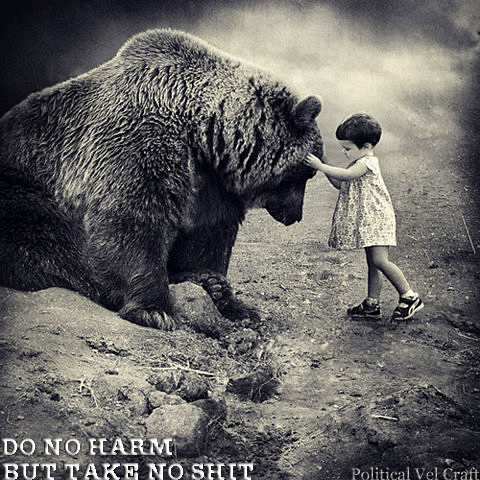 Someone to take the campaign for freedom into battle, and on to victory. When the two countries faced each other at the Battle of Stirling Bridge in 1297, Scotland was led to victory by a figure destined to become a national hero – William Wallace. – a hero of Scotland and a true patriot, had a burning desire for peace and freedom which united the country’s clans, gained the loyalty of its people, struck fear into his enemies and defied the cruel hand of an evil, warring and invading King – Edward I of England. Ensign Cross Of Saint Andrew Seen On His Shield. Later To Become The Confederate Flag Because Of All The Scottish Immigrants. 95% Of All Southern People Had No Slaves, Were Poor, And Disproportionately Taxed By The North. 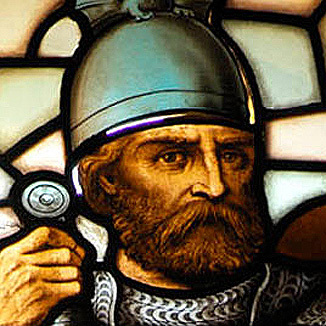 Sir William Wallace A Devout Catholic Is Seen As Another Saint Joan Of Arc. Who Both Fought The Corrupt English And Won Their Freedom. St. Andrews bones were entombed, and around 300 years later were moved by Emperor Constantine (the Great) to his new capital Constantinople. Legend suggests that a Greek Monk (although others describe him as an Irish assistant of St. Columba) called St. Rule (or St. Regulus) was warned in a dream that St. Andrews remains were to be moved and was directed by an angel to take those of the remains which he could to the “ends of the earth” for safe-keeping. St. Rule dutifully followed these directions, removing a tooth, an arm bone, a kneecap and some fingers from St. Andrew’s tomb and transporting these as far away as he could. That place was Scotland and it is here the association is believed to have begun. It was here that St. Rule was shipwrecked with his precious cargo. St. Rule is said to have come ashore at a Pictish settlement on the East Coast of Scotland and this later became St. Andrews. Another story is that Acca, the Bishop of Hexham, who was a reknown collector of relics, brought the relics of St. Andrew to St. Andrews in 733. 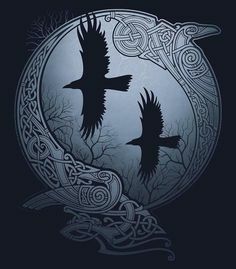 There certainly seems to have been a religious center at St. Andrews at that time, either founded by St. Rule in the 6th century or by a Pictish King, Ungus, who reigned from 731 – 761. Whichever tale is true, the relics were placed in a specially constructed chapel. This chapel was replaced by the Cathedral of St. Andrews in 1160, and St. Andrews became the religious capital of Scotland and a great center for Medieval pilgrims who came to view the relics. There are other legends of how St. Andrew and his remains became associated with Scotland,but there is little evidence for any of these, including the legend of St. Rule. The names still exist in Scotland today, including St. Rules Tower, which remains today amongst the ruins of St. Andrews Cathedral. It is not known what happened to the relics of St. Andrew which were stored in St. Andrews Cathedral, although it is most likely that these were destroyed during the Scottish Reformation. The Protestant cause, propounded by Knox, Wishart and others, won out over Roman Catholism during the Reformation and the “idolatry of catholism”, that is the Saints, relics, decoration of churches, were expunged during the process of converting the Roman Catholic churches of Scotland to the harsh simplicity of Knox’s brand of Calvanism. The place where these relics were kept within the Cathedral at St. Andrews is now marked by aplaque, amongst the ruins, for visitors to see. The larger part of St. Andrew’s remains were stolen from Constantinople in 1210 and are now to be found in Amalfi in Southern Italy. In 1879 the Archbishop of Amalfi sent a small piece of the Saint’s shoulder blade to the re-established Roman Catholic community in Scotland. During his visit in 1969, Pope Paul VI gave further relics of St. Andrew to Scotland with the words “Saint Peter gives you his brother” and these are now displayed in a reliquary in St. Mary’s Roman Catholic Cathedral in Edinburgh. The Rothschild bank financed the North and the Paris branch of the same bank financed the South, which is the real reason the Civil War was ignited and allowed to follow its long, and bloody course. The more Americans that die, the more money the Rothschild bankers made. SLAVERY was a diversion for the war, Lincoln’s contempt for rothschild central bank was the real reason for the fomentation as only 3% of the southern population had slaves. 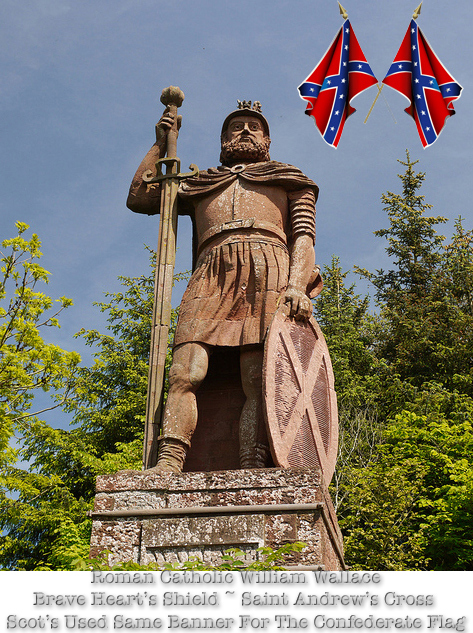 The majority of the South were Irish/Scottish Catholics who bannered Saint Andrew’s Cross ‘The Confederate Flag’. This is why rothschild propaganda is used to demean the Saint’s Flag as a icon of evil slavery of which it is not. Murder Of President Abraham Lincoln. Interestingly, it was the Czar of Russia who provided the needed assistance against the British and French, who were among the driving forces behind the secession of the South and her subsequent financing. Russia intervened by providing naval forces for the Union blockade of the South in European waters, and by letting both countries know that if they attempted to join the Confederacy with military forces, they would also have to go to war with Russia.The Rothschild interests did succeed, through their agent Treasury Secretary Salmon P. Chase, to force a bill (the National Banking Act) through Congress creating a federally chartered central bank that had the power to issue U.S. Bank Notes. The Lone Assassin Myth is Born Modern researchers have uncovered evidence of a massive conspiracy that links the following parties to the Bank of Rothschild: Lincoln’s Secretary of War Edwin Stanton, John Wilkes Booth, his eight co-conspirators, and over seventy government officials and businessmen involved in the conspiracy. When Booth’s diary was recovered by Stanton’s troops, it was delivered to Stanton. When it was later produced during the investigation, eighteen pages had been ripped out. These pages, containing the aforementioned names,were later found in the attic of one of Stanton’s descendants.From Booth’s trunk, a coded message was found that linked him directly to Judah P. Benjamin, the Civil War campaign manager in the South for the House of Rothschild. When the war ended, the key to the code was found in Benjamin’s possession.The assassin, portrayed as a crazed lone gunman with a few radical friends, escaped by way of the only bridge in Washington not guarded by Stanton’s troops.”Booth” was located hiding in a barn near Port Royal, Virginia, three days after escaping from Washington. He was shot by a soldier named Boston Corbett, who fired without orders. Whether or not the man killed was Booth is still a matter of contention, but the fact remains that whoever it was, he had no chance to identify himself. It was Secretary of War Edwin Stanton who made the final identification. Some now believe that a dupe was used and that the real John Wilkes Booth escaped with Stanton’s assistance. ← British Monarchy’s Attempt To Control The World By Stimulus Debt Enslavement : Glass Steagall Will Null And Void The Debt & The British Monarchy! !